From reading discussions here the general consensus seems to be that you should have a ratio of one kanban board for one team. How do you model multiple workflows in the team on one board? Specifically, I suppose, how do you represent processes with discrete sub-tasks that require coorindation between people, while still being able to implement a policy to limit work in progress, and being able to see the "capacity" and "backlog"? Board 1: Regular one-off team tasks, such as "check help desk"
It works well to have multiple kanban boards describing specific proecesses. However, this also means the "capacity" of the team is not represented in any one place. I disagree with your consensus. I would say the Kanban community in general assumes a decoupling between teams and Kanban systems and that a Kanban board should probably visualize a Kanban system. 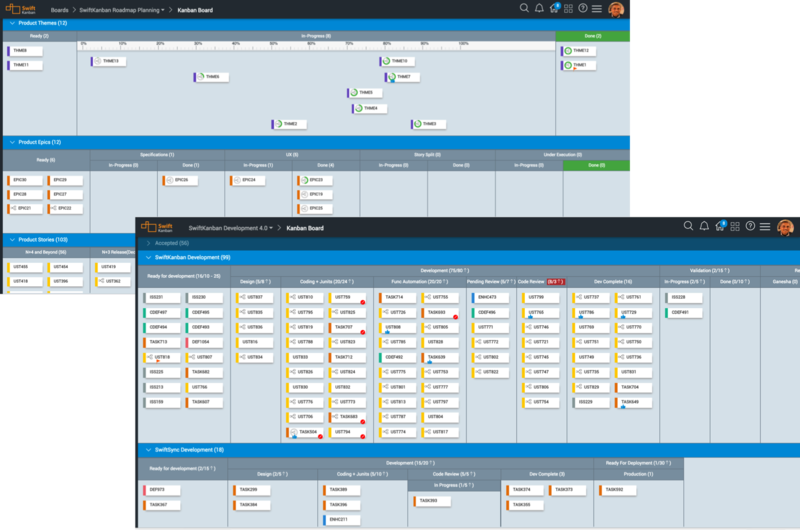 Multiple workflows should be different boards. Unless they have the same or mostly overlapping steps, in which case they could be on the same board and optionally separated by swim-lanes, or card colors or something. Regarding the issue that total team capacity is not represented in one place, that is true I guess, but it might be ok, in the end you have statistics like "over the last year we delivered 100 one-off tasks, created 40 articles and 20 videos", having fluid capacity across systems mean pull decisions can be supported by a checklist or some heuristics (based on e.g. cost of delay or something) so help the team member decide which board to pull from. If you need to, you could set up a sort of portfolio thing one level above the "team board" to set up wip limits across accounts or products (it probably makes more sense to split team capacity along a business oriented dimension rather than something arbitrary like item type). Setting up a portfolio probably makes more sense once you have at least 3 teams to manage though. I think you have hit on a fundamental point: when teams work with several different workflows at the same time it becomes difficult to measure their capacity. I guess the best solution will depend on what is more important to your organisation, an accurate knowledge of your capacity or an efficient workflow process. My advice would be to experiment with both approaches and see which provides the best results for your particular circumstances. In my experience, it helps to have one team be on a single Kanban board. Not only does it help them with capacity management (avoiding overloading, prioritization of work) but also managing dependencies between tasks and team members for overall better collaboration. It should be perfectly possible to define multiple swim lanes to define multiple workflows of the kind that you have defined. Here is an example of that - its a product team example, with separate lanes for product development (upstream) and product support (downstream). You can easily design a similar board with your own workflows - and a 3rd lane for the one-off tasks. The two workflows that you have described in your board 2 and board 3 examples are a classic upstream and downstream workflow example. Typically, the upstream work might be done by people who have more 'upstream roles' - such as designers, analysts, marketing folks - who are gathering market feedback, understanding customer requirements, etc. while the downstream workflow is done by people with downstream activity such as development, execution, production, testing, review and feedback and finally delivery. It sounds like in your case, your whole team is involved in all of the upstream and downstream activities. If this is not the case, you might consider a "sub-team" board - where each sub-team has their own board if they prefer that. However, just having swim lanes is equally effective - just depends on who clear are the team boundaries - and how much they need their own "space" to manage all of their work. In our case (we are a product company with a Kanban tool - SwiftKanban), we have an upstream board where our product management team does the kind of activities that you described in your board 2. As work gets defined better and prioritized, it is planned in one of our upcoming product releases - and when that release starts, the work moves to a separate dev board, where it is fully delivered and deployed on our cloud servers. On the other hand, in our marketing team, we simply have different swim lanes for themes, campaigns and deliverables (as well as a separate Events lane) and all of the team uses this one board. A single board helps with overall capacity management. However, technology gives you more options. If you are using an electronic tool, some tools (like ours) also help you define the WIP limits per person - so that irrespective of whether they are assigned to one or multiple boards, you always have an idea of whether they are overburdened or not - which is one of Kanban's key tenet - to reduce overburdening. 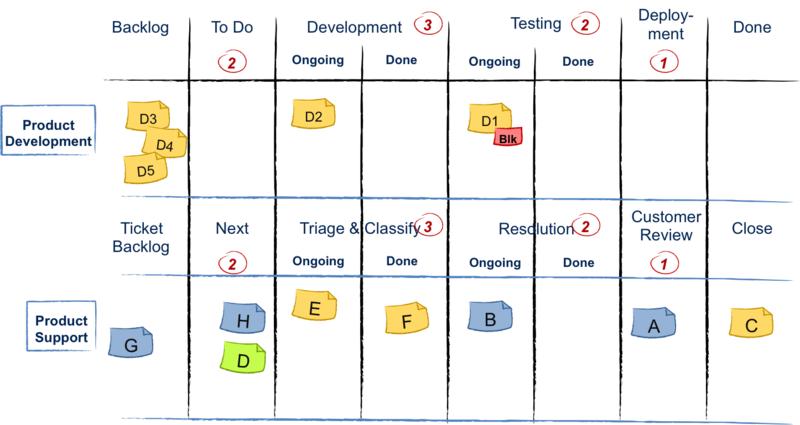 Finally, here is a white paper that may give you some ideas on how to design your boards - 10 Factors to Consider for your Kanban Board design. Not the answer you're looking for? Browse other questions tagged kanban kanban-board or ask your own question.